Last night, while lying in bed reading, I watched Delilah jump onto the bed and walk over to me, looking for some scratches. In the evenings, Delilah is pretty friendly, hoping up onto your stomach or chest but only for as long as you scratch the top of her head between her ears or her neck under her chin. I gave her the necessary attention but wanted to get back to my book, so she quickly hopped off of me and stretched out next to me. I was surprised when a few minutes later, Mr. Tigger jumped on the bed (on side of me opposite of Delilah). He stayed in that position for a bit, while I gave me scratches. However, his real goal is to be near Delilah, so he moved down to the foot of the bed and within a foot of Delilah. Delilah gave no indication that she was bothered by Tigger, but I know her and she likes to have the entire bed to herself (usually), so I watched as Delilah showed Tigger her disdain but rotating herself around so that she was in the same place but facing away from him. A few minutes later, Delilah jumped off the bed, followed shortly thereafter by Tigger. Tigger is my "the-glass-is-half-full" cat because he tries and tries to make friends with Delilah and Macy. He's smart too because he knows his best bet is with Delilah so I often find them in the same room. Tigger's plan is to get Delilah used to seeing him everywhere (he likes to eat in her presence, he sleeps in the same room as her during the day) before he makes his big move. Yesterday, I was happy to see that Tigger took advantage of Delilah's sleeping to get closer to Delilah than I have ever seen. They are practically cuddling. This is the closest I've ever seen them and they were like this for several hours. I love the Tigger so much for his willingess to try and to never accept defeat (or a swat from Delilah). Now, Miss Macy, she's been making some strides as well. I believe we suffered a setback with her (in terms of socialization) when we moved and then when she had her teeth cleaning. She was more skittish, less accepting of our touch, and only comfortable when she was in her cardboard box. However, in the last few weeks, Macy has given up her solitary ways and actually comes to sit next to us on the couch. We are also getting moments of her demanding to be petted, which results in her purring. I've been late to work because one of these "pet me NOW" moments happened as I was leaving one morning. I had to stay and take advantage of Macy allowing me to pet her entire body, in addition to her purring like mad and rubbing herself against me (again, rarely exhibited behavior by the Mace). I've recently tried to ramp up my independent study of teaching myself conversational Spanish. I've got the Pimsleur CDs in my car which I listen to during the drive to and from work. While this is very helpful, it's not enough and so I started looking online for (free) help for accelerating my studies. One website was very useful and gave me the great idea of watching a Spanish soap opera (telenovela) and putting the closed captioning on (in Spanish) so I could hear the language and see the words at the same time. So far, I've only done this with one episode and I'm watching it over and over. I can also submit the transcript to an online database that will translate it for me. Another really good idea is getting some children's books in Spanish. There are several free online and I might try to download them to the iPad. However, I know the best teaching I could get would be to try to speak with a native Spanish speaker. But I don't have any close friends who fit this description. I'm going to work on that and see what I can figure out. I have several big projects in mind. At the end of July, I want to knit a cardigan. I think I've found an easy pattern here. And I can use yarn I find at Michaels (red heart is a mass-market yarn). 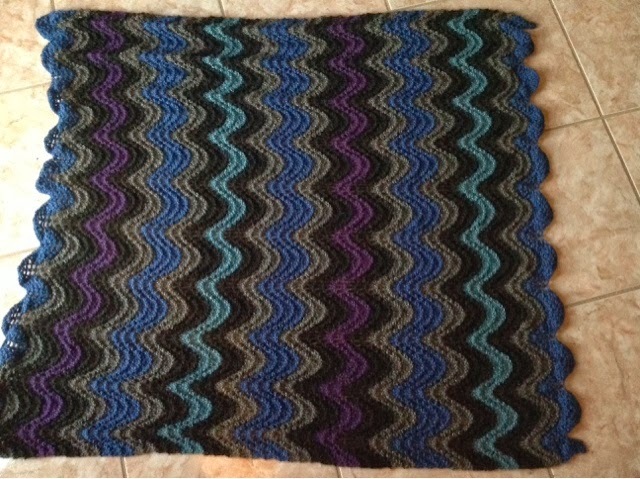 I also want to finish the ripple afghan that's been on the needles forever and start another one. But I'm in search of a pattern with more of a ripple (waves) than chevrons (points). 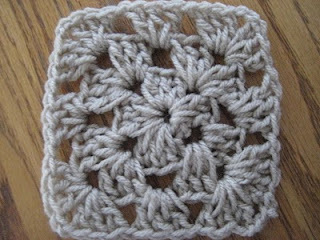 One big hinderance is that most ripple patterns are crochet, not knit. I am almost done with a washcloth that I knitted as part of a set. I made the hand towel and one washcloth. I didn't realize that the color combination was so Charlie Brown-looking. You will have to see it as a set when I finish the second washcloth (probably today). Until then, this is the hand towel. Mr. Grumpbump's birthday is tomorrow! He's going to be 45 years old. I have already given him his presents (I'm very bad about keeping gifts surprises) but I have a card for him and we will probably go to dinner somewhere. hi -- first, i must say that i love that you took pictures of mr tigger and delilah from all angles, so we could see the entire set up, LOL!!! Love it!!! and one more thing, i like the charlie brown washcloths -they are great!